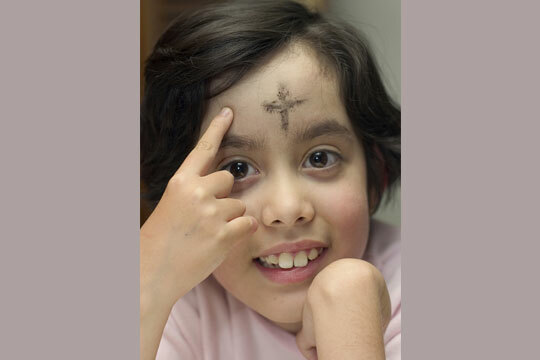 Ash Wednesday is popular with children because ashes are such a tangible symbol. People of all ages love when the spiritual is made physical, when they can touch and feel something real. The Church gives us sacramentals such as blessed ashes, palms, rosaries, and candles to help us open up to God’s grace. Explaining the meaning behind the ashes is important for children to understand why they are walking around with dirt on their foreheads. I like to explain Ash Wednesday using a visual, such as a bowl of ashes or fine dirt. I let the children feel its grittiness and make crosses on the back of their hands with it. I tell them that the ashes come from burnt palms from the previous year’s Palm Sunday Mass. Palms are a living plant, and a symbol of victory and triumph, but they are burned to dust and become a symbol of sorrow and repentance. To help children understand the meaning of the ashes, I explain the two prayers that might be said as the ashes are marked on the foreheads of the faithful. This phrase comes from God’s response to Adam (Genesis 3:19). God reminds Adam of the effects of sin and of humanity’s dependence on God. Read Genesis 2:4–9, and explain that the breath of God sustains all living things. Adam and Eve turned away from God when they ate from the tree of knowledge. When we mark our foreheads with ashes at the beginning of Lent, we are indicating that we are turning back to God. Wearing ashes on our foreheads is a tradition of repentance that comes from the Old Testament. There are several stories that mention ashes, but one that is easy for children to understand is the story of Jonah. When Jonah preached repentance to Nineveh, the king covered himself in sackcloth and ashes and ordered the people to do the same (Jonah 3:6–9). Ashes and scratchy clothes were a way for people to be humble before God and show that they were willing to make a big change in their lives. We are marked with ashes for the same reason: to show that we are willing to change. The physical symbol—ashes—is for our benefit. God knows what is in our hearts; the ashes remind us to turn our hearts toward God. The Church gives us Lent as a time to change, to become a better version of ourselves, and to become more like Jesus. The ashes we receive on Ash Wednesday remind us of our call to repent and believe in the Gospel. The disciplines of Lent—prayer, fasting, and almsgiving—help us prepare for Christ’s victory on Easter. 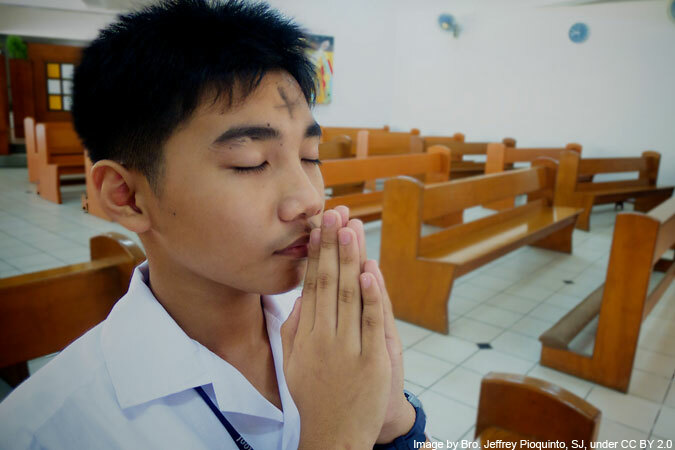 How do you explain the meaning of Ash Wednesday and Lent to children? Image by Bro. Jeffrey Pioquinto, SJ, under CC BY 2.0. Lent is Just Around the Corner – Living Stations, Anyone? When distributing ashes in a school mass setting, is it ok to simplify the language for the smallest children, 3 and 4 years old? Something like, “Stay close to Jesus.” Or are the specific words required?